Mazda's i-ELOOP (intelligent energy loop) system is designed to improve a car's fuel economy by reducing the work load on the engine. 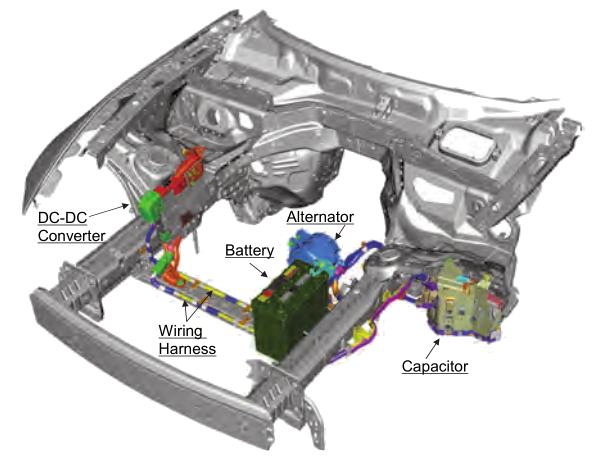 Normally a car generates electrical energy via the engine driven alternator to operate the onboard systems such as headlights, ignition system, climate control, stereo, navigation, heated seats, as well as keeping the battery charged. Mazda's ground breaking energy regeneration system does things a little different. During braking the i-ELOOP system converts kinetic energy from the wheels that would otherwise be wasted, to electrical energy through the alternator. This energy is then stored until the car beings to accelerate again. When this happens the alternator is switched off while the stored energy is used to power the car's electrical systems. This process repeats over and over as the car slows down and speeds up during a drive. With i-ELOOP the car burns less fuel to generate the electricity you need, helping to improve economy. Here's a short video to explain how the innovative system works. 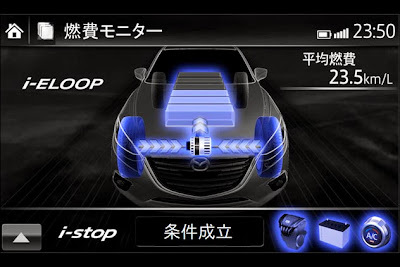 i-ELOOP was first introduced on the Takeri concept before launching on the updated Mazda 6, it was said to boost fuel economy by as much as 10% in "stop and go" city driving. 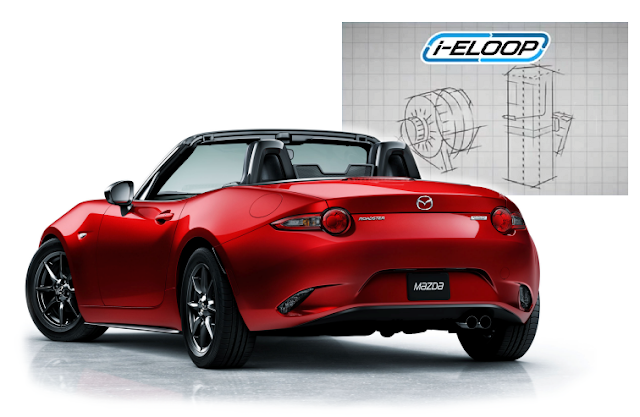 The system has since spread throughout the Mazda range, appearing in the 2, 3, CX-5, CX-3, and now the MX-5. It's not a hybrid in the usual sense as there is no electrical power supplied to assist the engine in driving the wheels. Instead it is a passive, unobtrusive means to gather wasted energy. You shouldn't really notice it in operation, but there is an App for the Mazda Connect system which displays the current capacitor charge and shows what's happening with the stored energy. Activation is also shown on the Multi-Information Display (MID) which is part of the new instrument cluster. The regeneration effect starts as soon as you take your foot off the accelerator and capacitor charging takes just a few seconds. Unlike rechargeable batteries, the capacitor won't noticeably deteriorate over time and should last the life of the car with thousands of charge/discharge loops. When the accelerator is pressed again, the stored energy is released through a DC/DC converter going from 25V to 12V to power the car's various electrical systems, including keeping the battery topped up. In this phase the alternator does not cause a load on the engine, allowing it to run more efficiently. There are 3 main components to the i-ELOOP system. Firstly there is the special variable-voltage alternator that can switch between 12V and 25V. If you are familiar with Ohm's Law you'll know that a higher voltage is desireable for transmission of electricity as it reduces the energy lost to resistance, and when the car is constantly charging and discharging it makes sense. The second component is a DC-to-DC power converter that is used to step down the voltage in the circuit from 25V to 12V. Finally there is the capacitor itself. This unit is an electric double-layer supercapacitor containing activated carbon, it is manufactured by Nippon Chemi-Con as part of their DLCAP range. The i-ELOOP system has not been without fault. Since it was launched Mazda has issued a number of global safety recalls because of technical and software glitches that caused the system to malfunction. Hopefully these little introductory issues have been ironed out by now, and won't cause any further trouble. For all the claims of extra economy, does such a system even belong in the MX-5? I can already hear the Roadster purists decrying i-ELOOP as an additional level of weight and complexity that simply isn't needed. It will likely form another argument for choosing the lower spec 1.5 model for the lighter weight and fewer unnecessary gadgets. The system is expensive so will appear exclusively in top-spec models for some markets, it also delivers only marginal economy benefits, and who buys a sportscar for the economy figures? 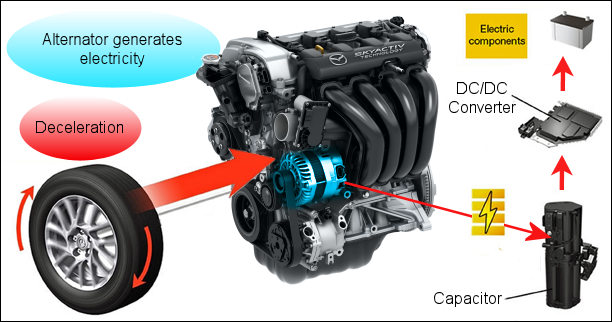 Nonetheless, it is interesting technology and yet another example of Mazda innovation.